This chapter discusses the different ways in which Elders and Community Representatives participate in the process, what they hope to achieve in relation to Indigenous partner violence, and to what extent conflicts within and between families is managed. 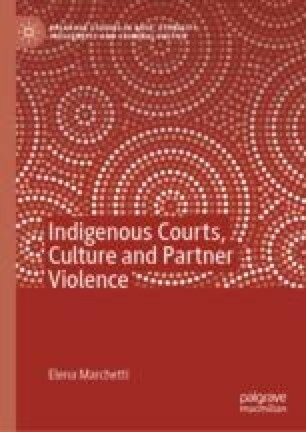 How and why the presence of Elders and Community Representatives make sentencing hearings more powerful for Indigenous partner violence offenders is explained using interview data collected from Indigenous sentencing court workers, Elders, Community Representatives, magistrates, defence lawyers, prosecutors and domestic and family violence service providers. The second part of the chapter relies on interviews of 30 offenders and 29 victims whose partners had been through an Indigenous sentencing court. The analysis compares victim and offender perceptions of justice of Indigenous sentencing and mainstream court processes.